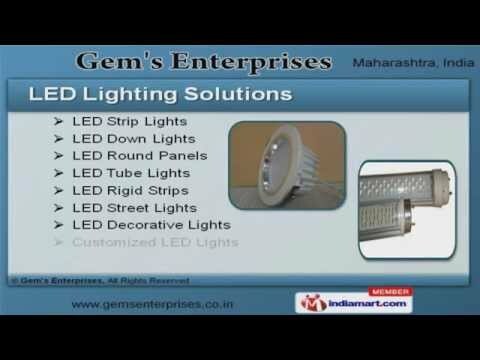 Welcome to Gems EnterprisesManufacturer & Supplier of LED Lighting Solutions and Laboratory EquipmentsThe company was incepted in the year 2000, at Pune. We are Associated with KusumEnterprises. IDBI-Bank & Amnora Park Town are some of our prestigious clients and we are backedby competitive prices & Utmost client satisfaction. We offer a vast range of LED Drivers, Lighting Solutions & Laboratory Equipments. Our LED Lighting Solutions are in huge demand across the global markets. LED Bulbs, Panel & Spot Lights offered by us are available at industry leading prices. Our LED Drivers are widely acclaimed in the market. We also provide LED Signage that are best in the industry amongst others. Along with that we offer Laboratory Equipments that are some of our best sellingproducts.